I had the opportunity to be inventive when designing a wedding reception invitation set for my brother and sister-in-law. They were married on a beach in Mexico and were planning their wedding reception state side in Wisconsin. The design for the reception invitation was inspired by their beach wedding. Images of star fish, colors of rich blue, deep brown and light tan along with curvilinear fonts, helped convey a cool beachy feel. The invitation was a two-sided design preferred in the middle with a tear-off reply post card. Also included in the set was a one-sided hotel and direction card. 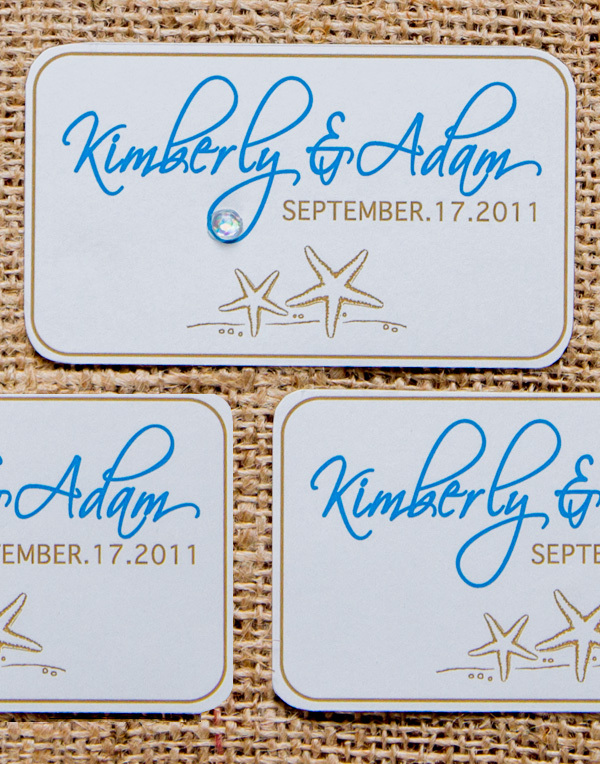 The invites were mailed in a white envelope with a star fish address label. I also designed paper labels in the same theme, that were attached to grass beach fans for the wedding ceremony.